As part of the Enlightenment! project we have been doing some research into our existing collections at Buxton Museum and Art Gallery. A couple of months ago we had a specialist come and take a look at our 18th and 19th century watercolours. He took one look at a painting we have of Martha Norton and immediately identified her as the work of John Nixon (1760 -1818). This was a really useful piece of information as we can now take her out of the ‘unknown artist’ category. We took the picture out of the frame and sure enough we found a signature on the back. The Museum bought this picture in 1985 and prior to that, we now know that it was sold at Christies in the 1970s and was once the property of the Governor and Directors of the French Hospital of La Providence. Martha Norton was the well keeper at St Anne’s well in Buxton. 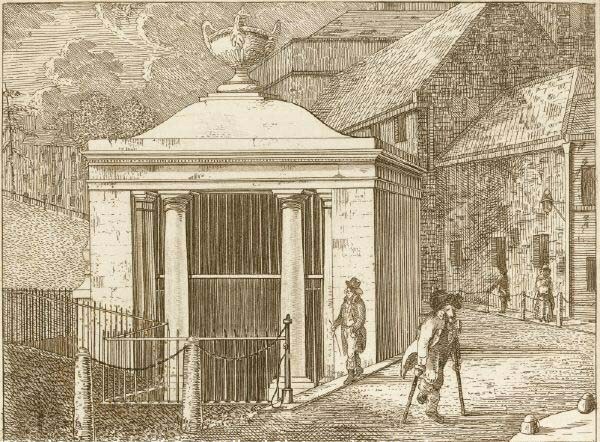 After the 1772 Buxton Enclosure Act the well became public property and had to be kept in a good state of repair. Every Easter a well woman was appointed to take care of the well and assist people who were taking the water. There was no salary and the well women had to rely on tips as an income. According to Mike Langham in his book ‘Buxton: A People’s History’, Martha was elected to the position 15 times between 1775 and 1820. We were really excited to find out our sketch was by John Nixon. 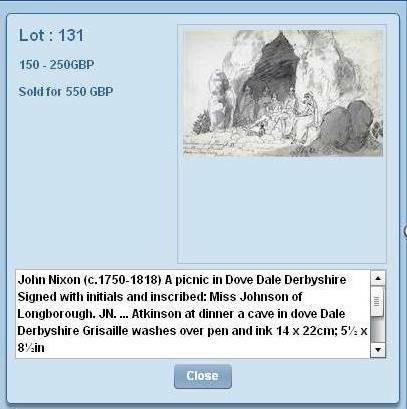 Alongside visiting Buxton we know that he visited Dovedale as we were outbid on a Nixon sketch of picnickers in Dovedale last year. At the time of this auction we did some research to try and establish when Nixon visited Derbyshire and where he went. I contacted a few museums who had work by Nixon to see whether they had any Derbyshire scenes (thank you Victoria Art Gallery, Bath and Ulster Museum). They didn’t have anything but Lucy Salt at Derby Museums found a reference in an old Christie’s auction catalogue which included a Nixon entitled ‘Entrance to Cromford’. The sketch of Dovedale contained the inscription, ‘3 Miss Johnsons of Loughborough . J.N…. Japer[?] Atkinson at Dinner in a cave in Dove Dale, Derbyshire’. We tried to figure out who these people were but had no luck. I wonder where the sketch has has ended up? There doesn’t appear to be a huge amount of information about Nixon. He was a wealthy Irish merchant and an amateur artist who was best known for his comical sketches. He seems to have visited many fashionable places (no surprise he came to Buxton then!) and drew the people he encountered. He was a friend of Thomas Rowlandson and they visited Bath together in 1792. 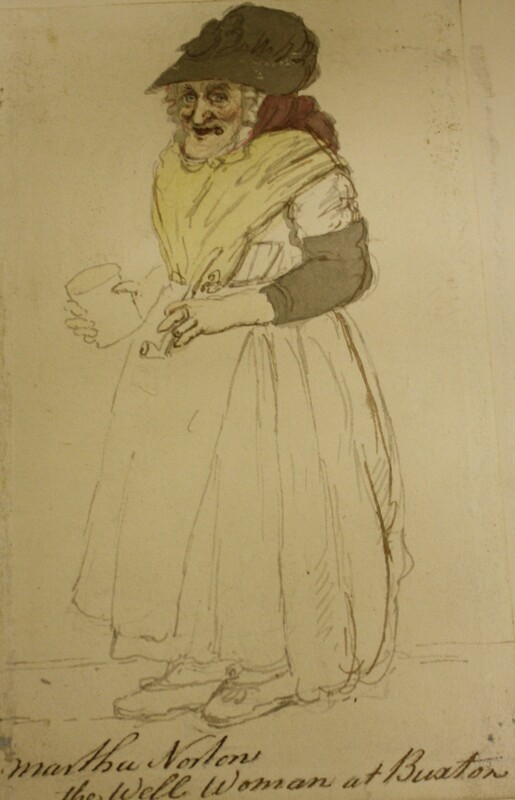 He also drew satirical sketches of his time in Paris and exhibited 39 paintings between 1781 and 1815 as an honorary exhibitor at the Royal Academy. (A lot of this info is lifted from Nixon’s entry in the Oxford Dictionary of National Biography).